Uterine aspirates were collected by aspiration with a Cornier Pipelle (Eurogine Ref. 03040200) in the office of the clinician or in the operating room prior to surgery and transferred to 1.5 ml microtubes. Phosphate buffer saline was added in a 1:1 (v/v) ratio and centrifuged at 2,500 rcf for 20 min in order to separate the soluble fraction (supernatant) from the solid fraction (pellet). The supernatants were kept at -80°C until use. 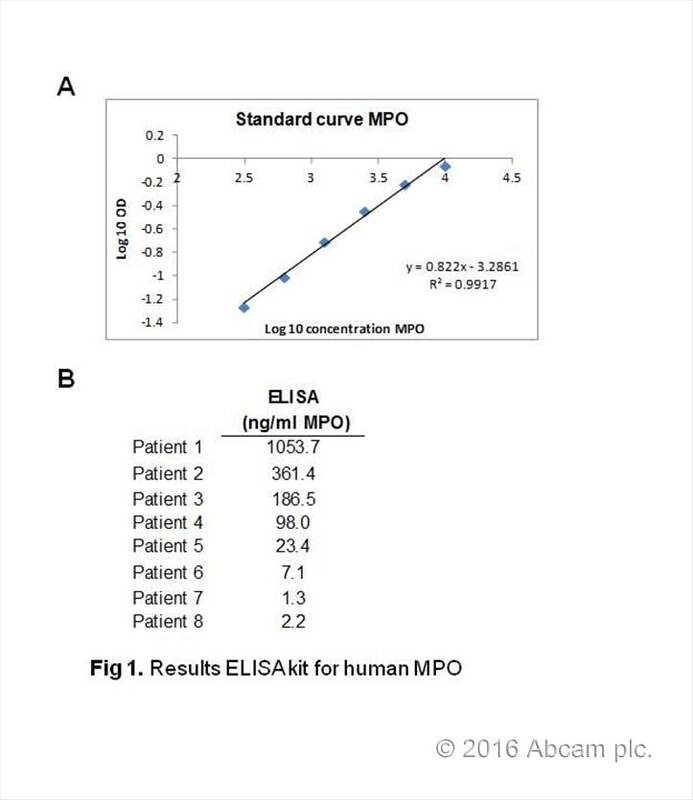 The concentrations of MPO in the soluble fraction of uterine aspirates were quantified with commercially available ELISA kit (Abcam, catalog number ab119605) according to the manufacturer´s protocol. As no results are available regarding the levels of these proteins in uterine aspirates, samples were diluted using five serial dilutions: 1:2, 1:10, 1:50, 1:300, 1:1500. The same amount of total protein from 8 uterine aspirates was loaded in each well. All samples were assayed in duplicates using a microplate reader and values were reported as ng/mL. The mean absorbance for each set of duplicate standards and samples was calculated. The standard curve was plotted in a log10-log10 scale (see figure 1A). The CV (%) between the duplicates of the samples ranged from 4-13% (average of 7%). Concentration of MMP9 of uterine aspirates ranged from 2 to 1053 ng/ul (see figure 1B).